PD Ports’ new £6m ship-to-shore crane is now in operation following an official opening ceremony at Teesport as part of the port operator’s strategic growth plans. During the ceremony, Frans Calje, PD Ports’ chief executive officer, said: “Pace and frequency are vital components in container shipping. The addition of a fifth ship to shore crane will further enhance our service performance by reducing the time taken to transfer containers from port to road and rail for UK distribution. “Supporting our customers to get their goods to market quickly and efficiently is at the core of our investments. Our success in achieving this will help us to grow and remain competitive not just as a business but as a region, improving economic prosperity across the North, enhancing skills and creating jobs. 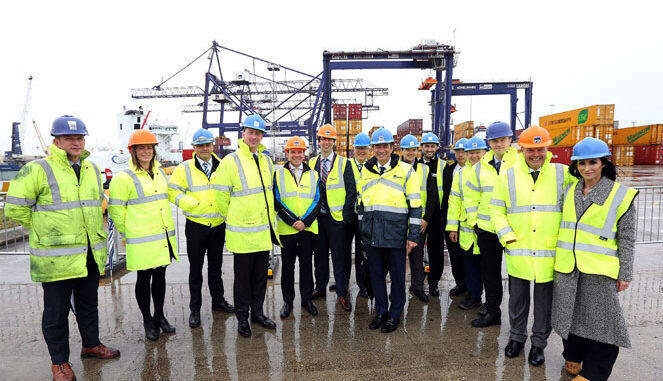 Co-financed by the European Union’s Connecting Europe Facility, the new ship to shore crane is situated at Teesport Container Terminal Two, boosting the Port’s ability to service greater container volumes which have grown 12% year on year for the last seven years.